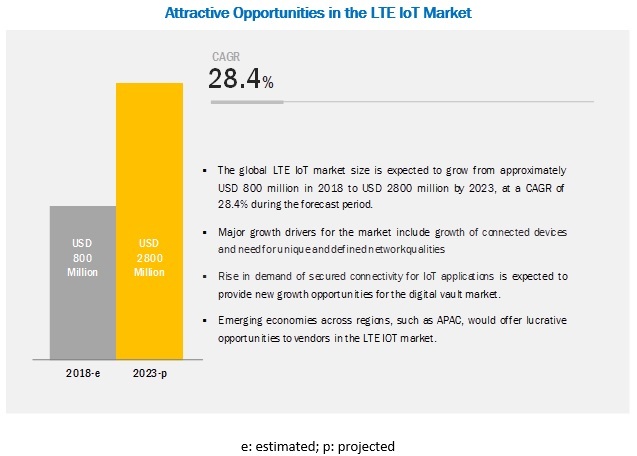 [109 Pages Report] The global LTE IoT Market size is expected to grow from USD 800 million in 2018 to USD 2800 million by 2023, at a Compound Annual Growth Rate (CAGR) of 28.4% during the forecast period. The major growth factors for the market include the growth of connected devices and the need for unique and defined network qualities. The manufacturing industry has witnessed tremendous transformation, owing to advancements in technologies, such as robotics and automated production lines. Due to the delicate nature of manufacturing operations, manufacturers are adopting IoT solutions, sensors, and IoT wireless connectivity platforms to increase their productivity, thereby transforming their operations into smart manufacturing. Many software and solution providers are offering industries smart manufacturing applications that include proactive and automatic analytics capabilities, making industrial manufacturing an intelligent and self-manageable environment. The LTE technology is availed to establish stable connectivity among various devices in a factory for data transmission, to enable industries to tackle the issues related to predictive maintenance and autonomous production. Professional services are required during and after the implementation of LTE IoT technologies, such as LTE-M and NB-IoT. These services typically include planning, design and implementation, consulting services, support and maintenance services, and upgrades. The professional services segment is a growing market, where big firms rely on the players for consulting and implementation services. In the LTE IoT market, professional services play a very important role, as for customers it is very important to understand the feasibility of LTE IoT solutions. Therefore, the companies providing these services have consultants, security experts, and dedicated project management teams that specialize in the design and delivery of critical decision support software, tools, services, and expertise. Europe is leading the LTE IoT market due to the widespread adoption of the LTE technology for enterprises’ IoT applications. The region is leading in terms of LTE IoT coverage area. Europe takes the credit that it coined the phrase IoT and has a major contribution to the promotion of IoT telecom and allied services across the globe. Moreover, the presence of telecom companies, such as Orange, Vodafone, and Deutsche Telekom, are playing an important role in bringing innovations to the telecom industry. This enables the region to adopt new technologies such as LTE-M and NB-IoT. Moreover, the government initiatives toward the adoption of such technologies are helping the vendors work on new advanced technologies. European Commission and European Union member states are committed to developing strategies to support experiments and the deployment of IoT telecom and allied services. Germany, UK, and France are the top 3 contributors to the LTE IoT market in Europe. The rising adoption of telco cloud, growing data consumption, increasing adoption of smart devices at a peak rate, and reduced cost of IoT components with the evolving wireless technology, such as 5G and NB-IoT, would drive the overall growth of LTE IoT. In November 2018, DISH Network partnered with Ericsson for its NB-IoT network. As per this agreement, Ericsson would provide radio access and core network to DISH Network. In June 2018, Ericsson partnered with Dialog Axiata Partners to deploy the first commercial massive IoT network supporting both Cat-M1 and NB-IoT technologies in South Asia. In November 2018, Vodafone New Zealand launched 2 cellular IoT network technologies, namely, NB-IoT and LTE-M on the existing 4G network infrastructure in the country. In August 2018, Telstra launched new IoT products: Telstra Locator, Track and Monitor, and Telstra Device Locator to help Australians locate the assets that matter most to them. What are the upcoming industry applications for the LTE IoT market? The study involved 4 major steps that helped estimate the current market size of the LTE IoT Market. Exhaustive secondary research was done to collect information about the parent market and peer markets. The next step was to validate these findings, assumptions, and sizing with industry experts across the value chain through primary research. Both top-down and bottom-up approaches were employed for estimating the complete market size. Thereafter, market breakup and data triangulation methods were used for estimating the market size of segments and subsegments. 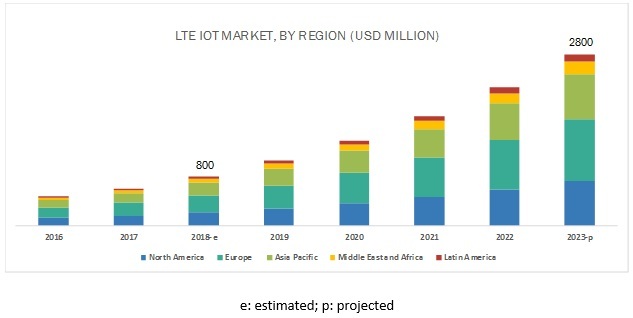 The LTE IoT market’s expenditure across regions and its geographic split in various segments have been considered to arrive at the overall market size. After arriving at the overall market size—using the market size estimation processes as explained above—the market was split into several segments and subsegments. To complete the overall market engineering process and arrive at the exact statistics of each market segment and subsegment, data triangulation methods and market breakup procedures were employed, wherever applicable. The data was triangulated by studying various factors and trends from both the demand and supply sides in all industry verticals. This research report categorizes the market based on technology, service, industry, and region.